One of the last remaining female members of the rarest turtle species in the world, the Yangtze giant softshell turtle, died at the Suzhou zoo in China on Saturday afternoon, according to CBS News. 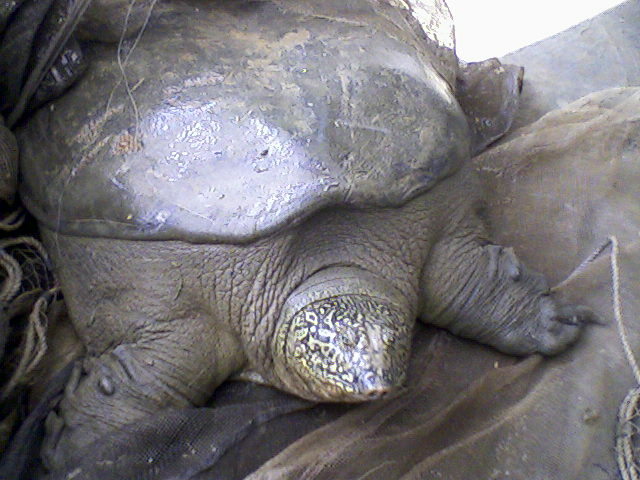 The turtle was one of four remaining in the world – one of the other is a female also at the Suzhou zoo, and the remaining two are males in Vietnam. The turtle was over 90-years-old and was in good health before it underwent an attempt at artificial insemination on Friday. But it died shortly after, leaving the remaining female softshell turtle alone at Suzhou zoo. The state-run People’s Daily reports that Yangtze giant softshell turtles originated in China in Yangtze River and Taihu Lake. The cause of the turtle’s death is still unknown but is being investigated by Suzhou authorities said Chinese and foreign experts. The Yangtze giant softshell turtle is listed as critically endangered by the International Union for Conservation of Nature (IUCN) and is the most critically endangered turtle in the world. Its risk of extinction is believed to be higher than ever due to the degradation of its freshwater habitat and over-harvesting. Unfortunately, the Yangtze giant softshell turtle is just one of many species of animals facing extinction. There are only a few dozen Amur leopards left in the wild. Distinctive for their long, thick spotted coats, they have been pushed closer to extinction by poaching, loss of habitat, and human development, per Medium. The elusive Eastern bongo is a large antelope species that lives in a remote region of the African forest. It was one of the last-discovered large mammal species and possesses stripy red coats to camouflage from predators. This beautiful chestnut coat with white stripes belongs to the Eastern bongo, the largest forest-dwelling antelope species. Both mountain gorillas and Cross River gorillas have been listed as critically endangered and endangered, respectively, by the IUCN since 1996, according to One Kind Planet. Nearly half of mountain gorillas live in the Virunga mountains in central Africa, while Cross River gorillas are more scattered and can be found in at least 11 groups in Cameroon and Nigeria. Less than 100 Vaquita are thought to exist on the planet, making them the rarest marine mammal in the world. These unique sea porpoises were only discovered in 1958 and are predicted to be extinct very soon. These frogs are two species of poisonous frogs that live in a small sub-alpine area of Australia. Known for their bright yellow and black stripes, they were almost wiped out once before from a fungus disease.